Hello! Please allow me to introduce you to my HERO. His name is PAUL LEROY GRAFFE. He was born on August 19, 1946 in Shelton, Washington. Paul Leroy Graffe is missing. But, you will find many, many people who care about him. They are the people who remember our Prisoner of War and Missing In Action men and women. The OV1C Mohawk aircraft was designed as a battlefield reconnaissance aircraft and was used primarily by the U.S. Army. The various models were outfitted with different detection equipment. The standard aircraft was not armed, but some carried various weapons. The C model featured infared detection equipment and a forward-aimed camera. Because the North Vietnamese and Viet Cong relied so heavily upon darkness to conceal their activities, the infared sensor proved especially valuable. On October 3, 1969, 1Lt. Paul L. Graffe, pilot; and PFC Kenneth L. Cunningham, observer; departed Phu Hiep, South Vietnam, during the early evening on a surveillance mission of targets located in the northwest portion of MR2 (Military Region 2) in the tri-border area of Cambodia, Laos and South Vietnam. The aircraft (serial #61-02679) failed to return at the scheduled time. The last radio contact with Graffe and Cunningham was at 1800 hours when another OV1 aircraft had been informed by Graffe that they were going to continue their mission for about 30 more minutes, and then begin the return trip to Phu Hiep. All further attempts at electronic contact with the missing OV1 were unsuccessful. On the morning of October 5, search and rescue aircraft located the wreckage of an aircraft atop a 7,000 foot peak in a mountain range north of the city of Kontum. This wreckage was positively identified as that of Graffe and Cunningham. Efforts were made to insert a ground team at the site on October 5 and 6, but inclement weather prevented the team from being inserted. On neither occasion was either visual or electronic contact made with the downed crew. On the morning of October 7, another attempt was made to insert a ground SAR team. However, the SAR pilots noticed a change in position in the aircraft wreckage, and the SAR aircraft was receiving continuous beeper signals from the ground. Since this continuous beeper signal was not compatible with established emergency radio procedures, the SAR flight leader directed that the site was probably a trap and withdrew from the area. Both crewmembers were declared Missing In Action. Graffe and Cunningham are among nearly 3000 Americans who were missing, prisoner or unaccounted for in Southeast Asia at the end of the war. Unlike the MIAs from other wars, most of these men can be accounted for. Tragically, over 10,000 reports relating to missing Americans in Southeast Asia have been received by the U.S., convincing many authorities that hundreds of men are still alive in captivity, yet freedom for them seems beyond our grasp! Please read PAUL LEROY GRAFFE IS MISSING! Paul's Plaque Courtesy of Wayner. His site is down, but hopefully it will be back up soon. Thank you Operation Just Cause, for Paul Leroy Graffe, my hero. 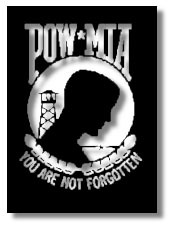 Visit them to adopt a POW/MIA and learn more about what you can do to help. What? Are you cynical? Do you have doubts? 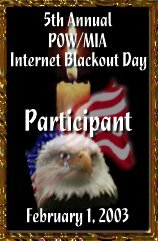 Do your really think all of our POW's were released during Operation Homecoming in 1973? 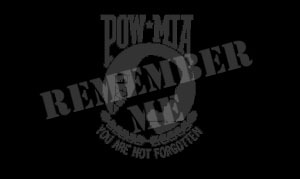 Please visit POW/MIA Forum for some important facts.